Our largest suite, the Penthouse B is a spacious two story apartment for families or groups of up to 6 guests. The master bedroom offers a Queen bed, with a secondary bedroom in which two Twin beds will host you. There is a studio as well with a Full sofa-bed. It also includes flat screen TV, work space in the living room and a fully equipped kitchen. From any of our suites you'll have a great view of our nature, you can just sit in your Queen size bed and listen to the waking up of the local birds. 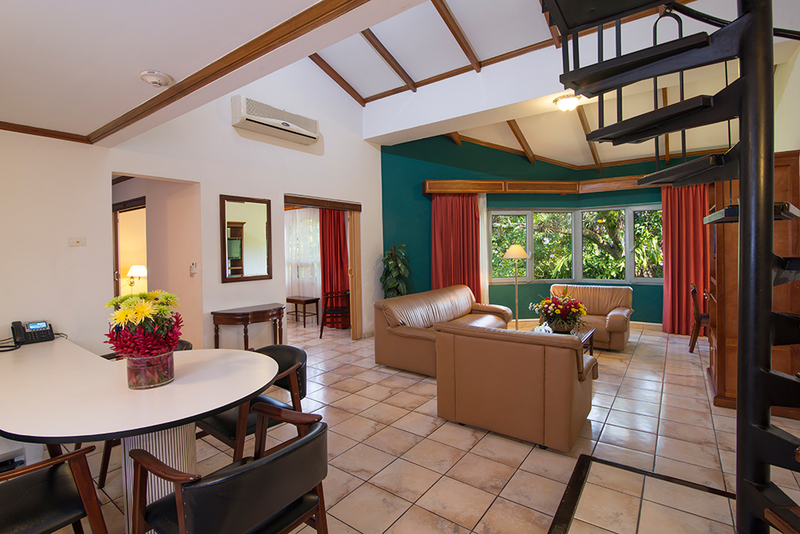 The living-room area is designed for groups and families, it is perfect to feel at home.